If I had a café, these buckwheat sweet potato crepes would be one of the dishes I would have on the menu. The crepes are awesome on their own but together with this vegetable stir-fry they are sublime. I got inspired when I saw an Ella Woodward recipe for sweet potato pancakes - though hers were more of the sweet variety containing lots of honey and cinnamon. 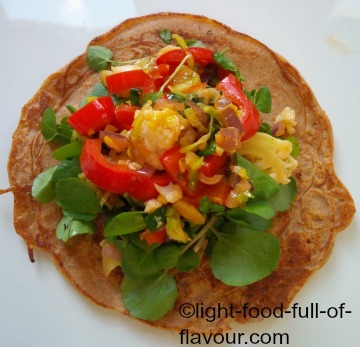 I wanted to use buckwheat flour and make mine savoury and a bit spicy. Contrary to what the name suggests, buckwheat has nothing to do with wheat – the grains are fruit seeds from the rhubarb family which are gluten-free. I am using oats milk for these crepes though. Oats contain gluten but not gliadin, a specific subset of gluten which is apparently what causes gluten intolerance. If you want these crepes to be completely gluten-free, swap the oats milk for rice milk. 1. To make the crepes, boil or steam the diced sweet potato until soft, about 10 minutes. Once cooked, allow the sweet potato to cool down before placing them in a blender with the oats milk, buckwheat flour, coriander, cumin and salt. Blend until you have a smooth batter. 2. Place a small amount of oil in a non-stick frying pan over a medium-high heat and allow the oil to get hot before adding about 3 tablespoons of batter to the frying pan. Use the back of the spoon to smooth out the batter into a quite thin, round crepe. Fry for about a 1 minute – 1 ½ minute before flipping it over. Fry the other side for about the same length of time, until the crepe is nicely browned on both sides. 3. Place the crepe on a plate and continue to fry until you have used up all the batter. Cover the crepes and keep them warm. 4. For the stir-fry, place the oil in a large frying pan or wok over quite a high heat. Add the onion, ginger, garlic and chilli and fry for 30 seconds. Add the cauliflower florets, sliced Brussels sprouts and peppers to the pan/wok and continue to fry for another minute. Finally, add the spring onions and soy sauce to the pan/wok and fry for a further 30 seconds. Remove the pan from the heat. To serve, place a small handful of watercress or rocket leaves on each pancake and top with some of the stir-fried vegetables.